Your adventure with Gonzo begins with setting your bet. Start with the coin size, which goes from £0.01 to £0.50. Then decide on how many coins you want to bet per line, via the “Level” option, and it can go from 1 to 5. The number of lines is fixed at 20, which means that if you choose the minimum at Level 1, with a coin size of £0.01, then that’s 20 coins (or a 20 line bet), which costs £0.20 per spin. Once your bet size is set, you’re ready to press the Spin button. Additionally, there’s an Autoplay feature that will make the reels spin (oops, we mean tumble!) into place automatically. The Max Bet button will set the Level to the highest at 5 coins, without affecting your coin value. The symbols in Gonzo’s Quest are, from highest to lowest value: Grey mask, Green mask, Yellow mask, Purple mask, Orange mask, Red mask, and Blue mask. Additionally, there’s a Wild symbol (grey stone with Question mark), and a Free Fall bonus symbol (Golden mask) that works like a scatter. The fixed jackpot in Gonzo’s Quest is won by spinning 5 Grey masks, which lands you 2,500x your line bet. Now, if it was won with an Avalanche feature or during the Free Falls Bonus round, that 2,500x can come with more multipliers – all the way up to 15x. That means it can add up to 37,500x your line bet! Avalanche Reels: This is part of the base game. Every time you hit a winning payline, the winning symbols will explode and disappear; remain symbols will fall into their new place, with new symbols falling down from the top to fill the hole. Not only does it function a bit like a free spin and will keep continuing until there are no more wins, but it even comes with multipliers to boost your win! From your 2nd Avalanche, you’ll get a 2x multiplier that’ll double your win, on your 3rd, a 3x multiplier, and from the 4th Avalanche onwards, a 5x multiplier. 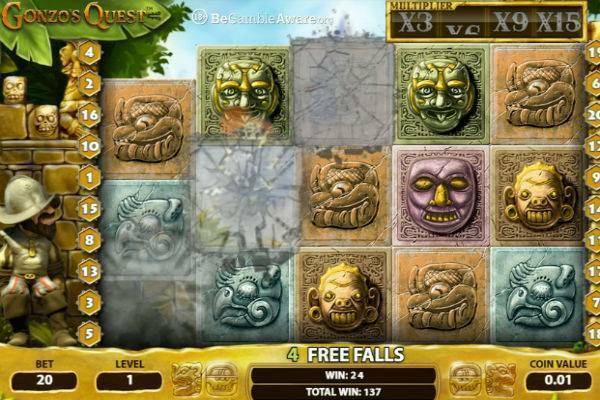 Free Fall Bonus: If you get 3 of the Free Fall symbols (a Golden mask) on a payline, you’ll activate the Free Fall bonus rounds, in which you get 10 free falls – that’s like 10 free spins. If you win during this round, from your first Avalanche you’ll get a 3x multiplier. On the 2nd and 3rd Avalanche, you’ll get a 6x and 9x multiplier respectively. From the 4th Avalanche onwards, it’s a 15x multiplier. The best part is that free falls can be re-triggered during the Free Fall Bonus round! 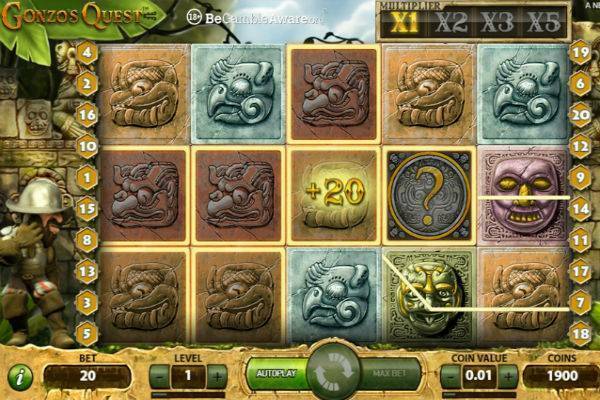 As with most NetEnt slots, Gonzo’s Quest is cutely and beautifully animated. 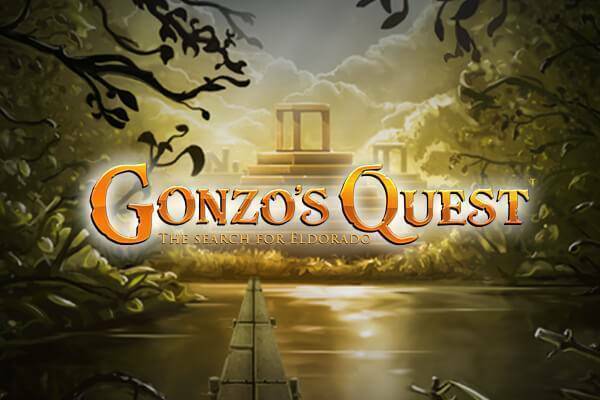 The game is set in a lush jungle, and Gonzo, the slightly wild but friendly explorer is at your side all the time, on a golden stage where the action happens. It’s all rather shiny and golden. The details of the Mayan masks on the symbols are intricately drawn, and as they tumble down, you can catch a glimpse of the golden temple in the background. The sound is amazing too, you can hear the blocks falling down and as they explode when you win. And with the bigger wins, there’s even a pan flute for you! Gonzo’s Quest is a truly brilliant game in many aspects. It’s an aesthetic pleasure with excellent gameplay. The Avalanche Reels are definitely a draw. Not only is it fun to watch those symbols fall into place, but watching them explode into dust and everything tumbling again into place is especially satisfying. The feature isn’t just cool: it’s almost like getting a free spin with every win, with a multiplier to boot. There’s also a bonus round with much higher multipliers to take things up a notch. 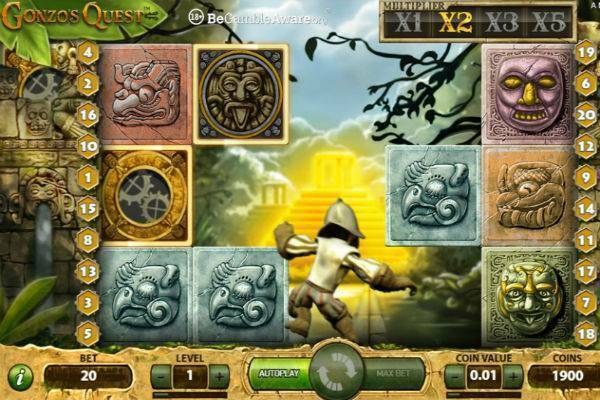 Head towards your own El Dorado with Gonzo at one of the recommended slot sites!